Whether it is through printing or electronic file-sharing, many Excel files are intended for distribution. 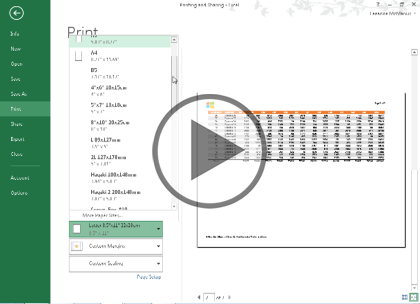 In this course, instructor LeeAnne McManus explains the layout, printing and sharing features you will need to understand in order to improve the final appearance of your Excel documents. This course assumes that students are familiar with the basic use of Windows and common use of the mouse and keyboard. No prior experience with Excel is assumed. Leeanne McManus is a nationally renowned trainer, facilitator, and productivity expert who has conducted thousands of sessions over the past decade. While widely recognized for helping end-users, departments, and organizations learn how to maximize their software products, most notably Office 365 and Adobe, Leeanne also facilitates sessions to enhance productivity and performance through soft skills development. Her professional background includes Human Resources, Operations, and Talent and Development.